Articles 32 and 33 of Regulation (EC) No 834/2007 lay down general provisions for import of organic products. With a view to guarantee that these provisions will be applied in a correct and uniform way, detailed rules and procedures for the application of those provisions should be laid down. As substantial experience has been built up since 1992 with the import of products providing equivalent guarantees, a relatively short period should be given to control bodies and control authorities to request their inclusion in the list for the purpose of equivalence in accordance with Article 33 of Regulation (EC) No 834/2007. However, as there is no experience with the direct application of Community rules on organic production and labelling of organic products outside the territory of the Community, more time should be given to control bodies and control authorities wishing to request their inclusion in the list for the purpose of compliance in accordance with Article 32 of Regulation (EC) No 834/2007. Therefore a longer period should be provided for sending in the requests and for examining them. For products imported according to Article 32 of Regulation (EC) No 834/2007, the operators concerned should be able to provide documentary evidence. It is necessary to establish a model for this documentary evidence. Products imported according to Article 33 of Regulation (EC) No 834/2007 should be covered by a certificate of inspection. It is necessary to lay down detailed rules with regard to the issuing of this certificate. Moreover, a procedure in order to coordinate at Community level certain controls on products imported from third countries which are intended to be marketed in the Community as organic should be laid down. Argentina, Australia, Costa Rica, India, Israel, New Zealand and Switzerland were previously listed as third countries from which imported products could be marketed in the Community as organic, under Commission Regulation (EC) No 345/2008 of 17 April 2008 laying down detailed rules for implementing the arrangements for imports from third countries provided for in Council Regulation (EEC) No 2092/91 on organic production of agricultural products and indications referring thereto on agricultural products and foodstuffs (2). The Commission has re-examined the situation of those countries according to the criteria set out in Regulation (EC) No 834/2007, taking into consideration the production rules applied and the experience gained with the import of organic products from these third countries as previously listed under Article 11(1) of Council Regulation (EEC) No 2092/2091. On this basis it is concluded that the conditions for inclusion of Argentina, Australia, Costa Rica, India, Israel, and New Zealand in the list of third countries for equivalency according to Article 33(1) of Regulation (EC) No 834/2007 are fulfilled. The European Community and the Swiss Confederation have concluded an Agreement on trade in agricultural products (3) approved by Decision 2002/309/EC of the Council and of the Commission (4). Annex 9 to that Agreement covers organically produced agricultural products and foodstuffs and sets out that the Parties must take the necessary measures so that organic products complying with each other’s laws and regulations can be imported and placed on the market. For the sake of clarity, Switzerland should also be listed in the list of third countries for equivalency according to Article 33(1) of Regulation (EC) No 834/2007. Member States’ authorities have acquired substantial experience and expertise in the field of granting access for organic imported goods into the territory of the Community. To establish and maintain the lists of third countries and control bodies and control authorities, this experience should be used and the Commission should be able to take account of reports from Member States and other experts. The tasks involved should be divided in a just and proportionate way. Provision should also be made for transitional measures applicable to third country applications received by the Commission before 1 January 2009, the date from which Regulation (EC) No 834/2007 applies. In order not to disrupt international trade, and to facilitate the transition between the rules established by Regulation (EEC) No 2092/2091 and those established by Regulation (EC) No 834/2007, it is necessary to extend the possibility of Member States to continue to grant authorisations to importers on a case by case basis for placing on the Community market of products until the measures necessary for the functioning of the new import rules have been put in place, in particular as regards the recognition of control bodies and control authorities referred to in Article 33(3) of Regulation (EC) No 834/2007. This possibility should be gradually phased out as the list of control bodies referred to in that Article is being established. In order to improve transparency and guarantee the application of this Regulation, an electronic system for exchange of information between the Commission, the Member States, the third countries, and the control bodies and control authorities should be foreseen. The detailed rules laid down in this Regulation replace those laid down in Commission Regulation (EC) No 345/2008 and in Commission Regulation (EC) No 605/2008 of 20 June 2008 laying down detailed rules for implementing the provisions concerning the certificate of inspection for imports from third countries under Article 11 of Council Regulation (EEC) No 2092/91 on organic production of agricultural products and indications referring thereto on agricultural products and foodstuffs (5). Those Regulations should therefore be repealed and replaced by a new Regulation. This Regulation lays down the detailed rules for the import of compliant products and the import of products providing equivalent guarantees as provided for in Articles 32 and 33 of Regulation (EC) No 834/2007. ‘assessment report’: means the assessment report referred to in Articles 32(2) and 33(3) of Regulation (EC) No 834/2007 drawn up by an independent third party fulfilling the requirements of ISO Standard 17011 or by a relevant competent authority, which includes information on document reviews, including the descriptions referred to in Articles 4(3)(b) and 11(3)(b) of this Regulation, on office audits, including critical locations and on risk-oriented witness audits conducted in representative third countries. 1. The Commission shall draw up a list of control bodies and control authorities, recognised for the purpose of compliance in accordance with Article 32(2) of Regulation (EC) No 834/2007. The list shall be published in Annex I to this Regulation. The procedures for drawing up and amending the list are defined in Articles 4, 16 and 17 of this Regulation. The list shall be made available to the public on the Internet in accordance with Articles 16(4) and 17 of this Regulation. the Internet address where the list of operators subject to the control system can be found, including their certification status and the product categories concerned, as well as suspended and decertified operators and products. 1. The Commission shall consider whether to recognise and include a control body or control authority in the list provided for in Article 3 upon receipt of a request for inclusion in this list from the representative of the control body or control authority concerned. Only complete requests that have been received before 31 October 2011 shall be considered, on the basis of the model of application made available by the Commission in accordance with Article 17(2), for the drawing up of the first list. For the following calendar years, only complete requests that have been received before 31 October of each year shall be considered. 2. The request can be introduced by control bodies and control authorities established in the Community or in a third country. any other information deemed relevant by the control body or control authority or by the Commission. 4. When examining a request for inclusion in the list of control body or control authority, and also any time after its inclusion, the Commission may request any further information, including the presentation of one or more on-the-spot examination reports established by independent experts. Furthermore, the Commission may, based on risk-assessment and in case of suspected irregularities, organise an on-the-spot examination by experts it designates. 5. The Commission shall assess whether the technical dossier referred to in paragraph 3 and the information referred to in paragraph 4 are satisfactory and may subsequently decide to recognise and include a control body or control authority in the list. The decision shall be taken in accordance with the procedure referred to in Article 37(2) of Regulation (EC) No 834/2007. the control body or control authority shall make available to interested parties, on an Internet website, a continuously updated list of operators and products certified as organic. 2. If a control body or a control authority does not send the annual report, referred to in paragraph 1(c), does not keep available or does not communicate all information related to its technical dossier, control system or updated list of operators and products certified as organic, or does not agree to an on-the-spot examination, after request by the Commission within a period which the Commission shall determine according to the severity of the problem and which generally may not be less than 30 days, that control body or control authority may be withdrawn from the list of control bodies and control authorities, in accordance with the procedure referred to in Article 37(2) of Regulation (EC) No 834/2007. If a control body or a control authority fails to take appropriate and timely remedial action, the Commission shall withdraw it from the list without delay. 1. The documentary evidence required for import of compliant products referred to in Article 32(1)(c) of Regulation (EC) No 834/2007, shall, in accordance with Article 17(2) of this Regulation, be established on the basis of the model set out in Annex II to this Regulation and contain at least all the elements that are part of that model. 2. The original documentary evidence shall be established by a control authority or the control body which has been recognised for issuing that documentary by a decision as referred to in Article 4. 3. The authority or body issuing the documentary evidence shall follow the rules established in accordance with Article 17(2) and in the model, notes and guidelines made available by the Commission via the computer system enabling electronic exchange of documents referred to in Article 17(1). 1. The Commission shall establish a list of recognised third countries in accordance with Article 33(2) of Regulation (EC) No 834/2007. The list of recognised countries is set out in Annex III to this Regulation. The procedures for drawing up and amending the list are defined in Articles 8 and 16 of this Regulation. Amendments to the list shall be made available to the public on the Internet in accordance with Articles 16(4) and 17 of this Regulation. the duration of the inclusion in the list. 1. The Commission shall consider whether to include a third country in the list provided for in Article 7 upon receipt of a request for inclusion, from the representative of the third country concerned. 2. The Commission shall only be required to consider a request for inclusion which meets the following preconditions. any other information deemed relevant by the third country or by the Commission. 3. When examining a request for inclusion in the list of recognised third countries, and also any time after its inclusion, the Commission may request any further information, including the presentation of one or more on-the-spot examination reports established by independent experts. Furthermore, the Commission may, based on risk-assessment and in case of suspected irregularities organise an on-the-spot examination by experts it designates. 4. The Commission shall assess whether the technical dossier referred to in paragraph 2 and the information referred to in paragraph 3 are satisfactory and may subsequently decide to recognise and include a third country in the list. The decision shall be taken in accordance with the procedure referred to in Article 37(2) of Regulation (EC) No 834/2007. in the light of any information received, the Commission may at any time amend the specifications relating to the third country and may suspend the entry of that country from the list referred to in Article 7; a similar decision may also be made where a third country has not supplied information required or where it has not agreed to an on-the-spot examination. 2. If a third country does not send the annual report, referred to Article 33(2) of Regulation (EC) No 834/2007, does not keep available or does not communicate all information related to its technical dossier or control system or does not agree to an on-the-spot examination, after request by the Commission within a period which the Commission shall determine according to the severity of the problem and which generally may not be less than 30 days, that third country may be withdrawn from the list, in accordance with the procedure referred to in Article 37(2) of Regulation (EC) No 834/2007. 1. The Commission shall draw up a list of control bodies and control authorities, recognised for the purpose of equivalence in accordance with Article 33(3) of Regulation (EC) No 834/2007. The list shall be published in Annex IV to this Regulation. The procedures for drawing up and amending the list are defined in Articles 11, 16 and 17 of this Regulation. The list shall be made available to the public on the Internet in accordance with Articles 16(4) and 17 of this Regulation. the Internet website where the list of operators subject to the control system can be found, as well as a contact point where information is readily available on their certification status, the product categories concerned, as well as suspended and decertified operators and products. 3. 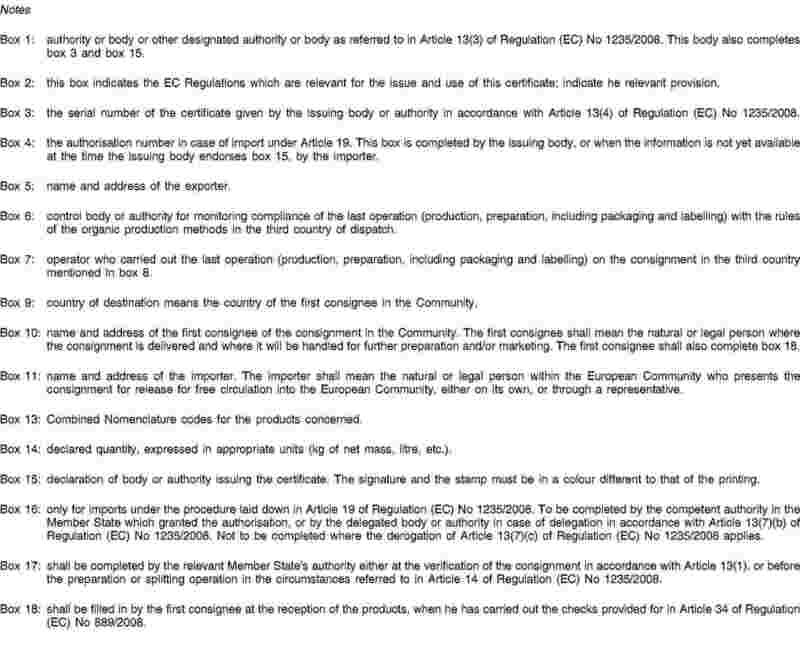 By way of derogation from paragraph 2(b), those products originating from third countries listed in the list of recognised third countries as referred to in Article 7 which belong to a category which is not referred to in that list may be listed in the list provided for in this Article. 1. The Commission shall consider whether to include a control body or control authority in the list provided for in Article 10 upon receipt of a request for inclusion from the representative of the control body or control authority concerned on the basis of the model of application made available by the Commission in accordance with Article 17(2). Only complete requests that have been received by 31 October 2009 shall be considered for the drawing up of the first list. For the following calendar years, the Commission shall undertake regular updates of the list as appropriate on the basis of complete requests that have been received before 31 October of each year. 4. When examining a request for inclusion in the list of control body or control authority, and also any time after its inclusion, the Commission may request any further information, including the presentation of one or more on-the-spot examination reports established by independent expert. Furthermore, the Commission may organise an on-the-spot examination by experts it designates on a risk-based approach and in case of suspected irregularities. 5. The Commission shall assess whether the technical dossier referred to in paragraph 2 and the information referred to in paragraph 3 are satisfactory and may subsequently decide to recognise and include a control body or control authority in the list. The decision shall be taken in accordance with the procedure referred to in Article 37(2) of Regulation (EC) No 834/2007. the control body or control authority shall make available to interested parties, by electronic means, a continuously updated list of operators, and of products certified as organic. 2. 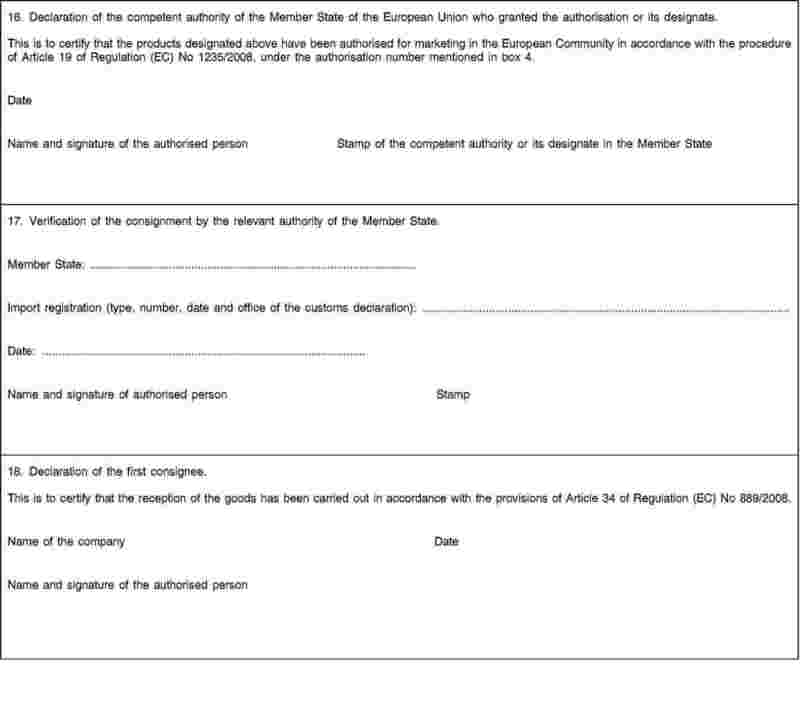 If a control body or a control authority does not send the annual report, referred to in paragraph 1(b), does not keep available or does not communicate all information related to its technical dossier, control system or updated list of operators and products certified as organic, or does not agree to an on-the-spot examination, after request by the Commission within a period which the Commission shall determine according to the severity of the problem and which generally may not be less than 30 days, that control body or control authority may be withdrawn from the list of control bodies and control authorities, in accordance with the procedure referred to in Article 37(2) of Regulation (EC) No 834/2007. on the verification of the consignment by the relevant Member State’s authority and the endorsement of the certificate of inspection in accordance with paragraph 8 of this Article. 2. The original certificate of inspection shall be established in accordance with Article 17(2) and paragraphs 3 to 7 of this Article, on the basis of the model and the notes set out in Annex V. The model notes, together with guidelines referred to in Article 17(2), shall be made available by the Commission via the computer system enabling electronic exchange of documents referred to in Article 17.
the control authority or control body in the third country listed for the third country concerned recognised under Article 11(5). it has either made a physical check of the consignment, or it has received an explicit declaration of the exporter declaring that the consignment concerned has been produced and/or prepared in accordance with Article 33 of Regulation (EC) No 834/2007; it shall carry out a risk-oriented verification of the credibility of this declaration. It shall furthermore give a serial number to each issued certificate and keep a register of the delivered certificates in chronological order. 5. The certificate of inspection shall be drawn up in one of the official languages of the Community and filled in, except for the stamps and signatures, either entirely in capital letters or entirely in typescript. The certificate of inspection shall be in one of the official languages of the Member State of destination. Where necessary, the relevant Member State’s authorities may request a translation of the certificate of inspection in one of its official languages. 6. The certificate of inspection shall be made in one single original. The first consignee or, where relevant, the importer may make a copy for the purpose of informing the control authorities and control bodies in accordance with Article 83 of Regulation (EC) No 889/2008. Any such copy shall carry the indication ‘COPY’ or ‘DUPLICATE’ printed or stamped thereon. the names of the products concerned. 8. At the verification of a consignment, the original certificate of inspection shall be endorsed by the relevant Member State’s authorities in box 17 and returned to the person who submitted the certificate. 9. The first consignee shall, at the reception of the consignment, complete box 18 of the original of the certificate of inspection, to certify that the reception of the consignment has been carried out in accordance with Article 34 of Regulation (EC) No 889/2008. 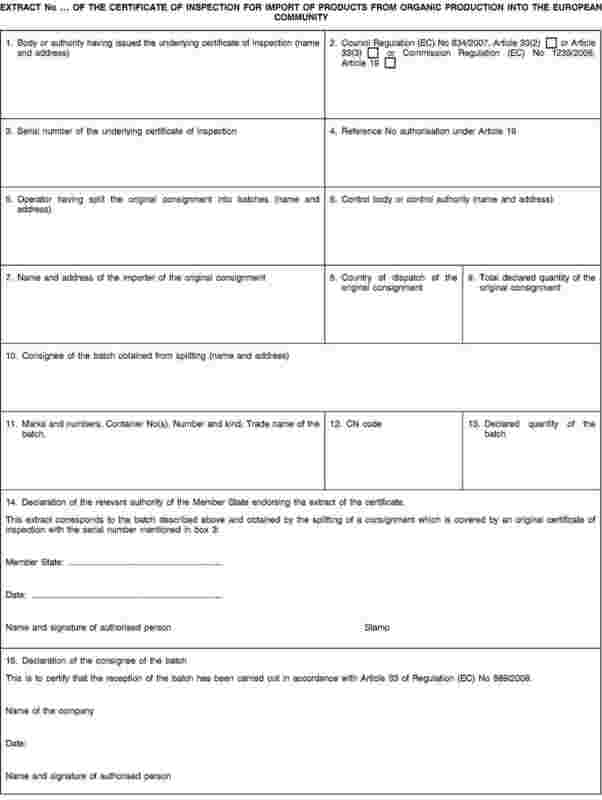 The first consignee shall then send the original of the certificate to the importer mentioned in box 11 of the certificate, for the purpose of the requirement laid down in the second subparagraph of Article 33(1) of Regulation (EC) No 834/2007, unless the certificate has to further accompany the consignment referred to in paragraph 1 of this Article. 10. The certificate of inspection may be established by electronic means, using the method made available to the control authorities or control bodies by the Member State concerned. The competent authorities of the Member States may require that the electronic certificate of inspection be accompanied by an advance electronic signature within the meaning of Article 2(2) of Directive 1999/93/EC of the European Parliament and of the Council (7). In all other cases, the competent authorities shall require an electronic signature offering equivalent assurances with regard to the functionalities attributed to a signature by applying the same rules and conditions as these defined in the Commission’s provisions on electronic and digitised documents, set out by Commission Decision 2004/563/EC, Euratom (8). 1. Where a consignment coming from a third country is assigned to customs warehousing or inward processing in the form of a system of suspension as provided for in Council Regulation (EEC) No 2913/92 (9), and subject to one or more preparations as defined in Article 2(i) of Regulation (EC) No 834/2007, the consignment shall be subject, before the first preparation is carried out, to the measures referred to in Article 13(1) of this Regulation. After this preparation, the endorsed original of the certificate of inspection shall accompany the consignment, and shall be presented to the relevant Member State’s authority, which shall verify the consignment for the purpose of its release for free circulation. After this procedure, the original of the certificate of inspection shall, where relevant, be returned to the importer of the consignment, referred to in box 11 of the certificate to fulfil the requirement laid down in the second subparagraph of Article 33(1) of Regulation (EC) No 834/2007. 2. Where, under a suspensive customs procedure pursuant to Regulation (EEC) No 2913/92, a consignment coming from a third country is intended to be submitted in a Member State, before its release for free circulation in the Community, to a splitting into different batches, the consignment shall be subject, before this splitting is carried out, to the measures referred to in Article 13(1) of this Regulation. For each of the batches which results from the splitting, an extract of the certificate of inspection shall be submitted to the relevant Member State’s authority, in accordance with the model and the notes set out in Annex VI. The extract from the certificate of inspection shall be endorsed by the relevant Member State’s authorities in box 14. A copy of each endorsed extract from the certificate of inspection shall be kept together with the original certificate of inspection by the person identified as the original importer of the consignment and mentioned in box 11 of the certificate of inspection. This copy shall carry the indication ‘COPY’ or ‘DUPLICATE’ printed or stamped thereon. After the splitting, the endorsed original of each extract of the certificate of inspection shall accompany the batch concerned, and shall be presented to the relevant Member State’s authority, which shall verify the batch concerned for the purpose of its release for free circulation. 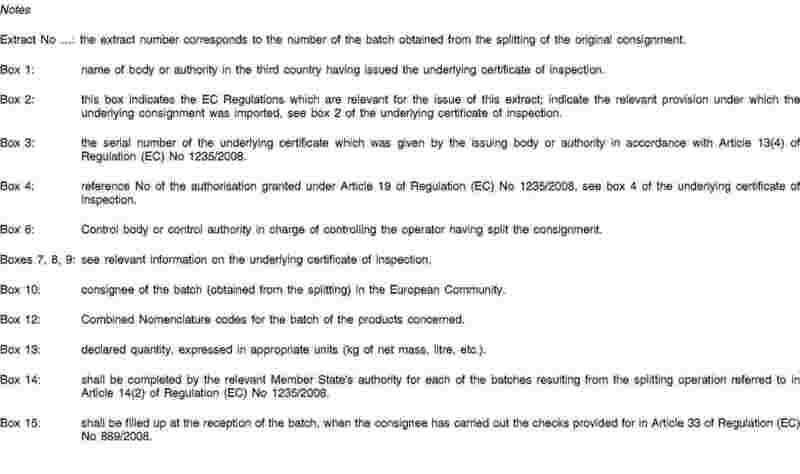 The consignee of a batch shall, at the reception thereof complete the original of the extract of the certificate of inspection in box 15, in order to certify that the reception of the batch has been carried out in accordance with Article 34 of Regulation (EC) No 889/2008. The consignee of a batch shall keep the extract of the certificate of inspection at the disposal of the control authorities and/or control bodies for not less than two years. 3. The preparation and splitting operations referred to in paragraphs 1 and 2 shall be carried out in accordance with the relevant provisions set out in Title V of Regulation (EC) No 834/2007 and in Title IV of Regulation (EC) No 889/2008. Without prejudice to any measures or actions taken in accordance with Article 30 of Regulation (EC) No 834/2007 and/or Article 85 of Regulation (EC) No 889/2008, the release for free circulation in the Community of products not in conformity with the requirements of that Regulation shall be conditional on the removal of references to organic production from the labelling, advertising and accompanying documents. 1. The Commission shall examine the requests received in accordance with Articles 4, 8 and 11 with the assistance of the Committee on organic production, referred to in Article 37(1) of Regulation (EC) No 834/2007 (hereafter called ‘the Committee’). For this purposes the Committee shall adopt specific internal rules of procedure. In order to assist the Commission with the examination of the requests and with the management and review of the lists, the Commission shall set up an expert group consisting of governmental and private experts. 2. For each request received, and after appropriate consultation with Member States in accordance with the specific internal rules of procedure, the Commission shall nominate two Member States to act as co-reporters. The Commission shall divide the requests between the Member States proportionally with the number of votes of each Member State in the Committee on organic production. The co-reporting Member States shall examine the documentation and information as set out in Articles 4, 8 and 11 related to the request and shall draw up a report. For the management and review of the lists, they shall also examine the annual reports and any other information referred to in Articles 5, 9 and 12 related to the entries on the lists. 3. Taking into account the result of the examination by the co-reporting Member States, the Commission shall decide, in accordance with the procedure referred to in Article 37(2) of Regulation (EC) No 834/2007, on the recognition of third countries, control bodies or control authorities, their inclusion on the lists or any modification of the lists, including the attribution of a code number to those bodies and authorities. The decisions shall be published in the Official Journal of the European Union. 4. The Commission shall make the lists available to the public by any appropriate technical means, including publication on the Internet. 1. When transmitting documents or other information referred to in Articles 32 and 33 of Regulation (EC) No 834/2007 and in this Regulation to the Commission or the Member States, the competent authorities of third countries, the control authorities or the control bodies shall use electronic transmission. When specific electronic transmission systems are made available by the Commission or the Member States, they shall use these systems. The Commission and the Member States shall also use these systems to provide each other with concerned documents. 2. For the form and content of documents and information referred to in Articles 32 and 33 of Regulation (EC) No 834/2007 and in this Regulation, the Commission shall set out guidelines, models and questionnaires where appropriate and make them available in the computer system referred to in paragraph 1 of this Article. These guidelines, models and questionnaires shall be adapted and updated by the Commission, after having informed the Member States and the competent authorities of third countries, as well as the control authorities and control bodies recognised in accordance with this Regulation. 3. The computer system provided for in paragraph 1 shall be able to collect the requests, documents and information referred to in this Regulation where appropriate, including the authorisations granted pursuant to Article 19. 4. The supporting documents referred to in Articles 32 and 33 of Regulation (EC) No 834/2007 and in this Regulation, in particular in Articles 4, 8 and 11, shall be kept by the competent authorities of third countries, the control authorities or the control bodies at the disposal of the Commission and the Member States for at least three years following the year in which the controls took place or the certificates of inspection and documentary evidence were delivered. 5. Where a document or procedure provided for in Articles 32 and 33 of Regulation (EC) No 834/2007 or in the detailed rules for its application requires the signature of an authorised person or the approval of a person at one or more of the stages of that procedure, the computer systems set up for the communication of those documents must make it possible to identify each person unambiguously and provide reasonable assurance that the contents of the documents, including as regards the stages of the procedure, cannot be altered, in accordance with Community legislation, and in particular with Commission Decision 2004/563/EC, Euratom. Requests for inclusion from third countries submitted in accordance with Article 2 of Regulation (EC) No 345/2008 before the 1 January 2009 shall be treated as applications under Article 8 of this Regulation. The first list of recognised countries shall include Argentina, Australia, Costa Rica, India, Israel, New Zealand and Switzerland. It shall not contain the code numbers referred to in Article 7(2)(f) of this Regulation. These code numbers shall be added before 1 July 2010 by updating the list in accordance with Article 17(2). 1. In accordance with Article 40 of Regulation (EC) No 834/2007 the competent authority of a Member State may authorise importers in that Member State, where the importer has notified his activity in accordance with Article 28 of that Regulation, to place on the market products imported from third countries which are not included in the list referred to in Article 33(2) of that Regulation, provided that the importer provides sufficient evidence showing that the conditions referred to in Article 33(1)(a) and (b) of that Regulation are satisfied. Where, having first allowed the importer or any other person concerned to comment, the Member State considers that those conditions are no longer satisfied, it shall withdraw the authorisation. Authorisations shall expire at the latest 24 months after the publication of the first list of control bodies and control authorities recognised pursuant to Article 10 of this Regulation. The imported product shall be covered by a certificate of inspection as set out in Article 13, issued by the control authority or the control body which has been accepted for issuing the certificate of inspection by the competent authority of the authorising Member State. The original of the certificate must accompany the goods to the premises of the first consignee. Thereafter the importer must keep the certificate at the disposal of the control body and, as appropriate the control authority, for not less than two years. 2. Each Member State shall inform the other Member States and the Commission of each authorisation granted pursuant to this Article, including information on the production standards and control arrangements concerned. 3. At the request of a Member State or at the Commission’s initiative, an authorisation granted pursuant to this Article shall be examined by the Committee on organic production. If this examination discloses that the conditions referred to in Article 33(1)(a) and (b) of Regulation (EC) No 834/2007 are not satisfied, the Commission shall require the Member State which granted the authorisation to withdraw it. 4. Member States may no longer grant the authorisations referred to in paragraph 1 of this Article from the date of 12 months after the publication of the first list of control bodies and control authorities referred to in Article 11(5) except if the imported products in question are goods whose production in the third country was controlled by a control body or control authority not on the list set up in accordance with Article 10. 5. Member States shall no longer grant any authorisation referred to in paragraph 1 from 1 January 2013. 6. Any authorisation to market products imported from a third country which had, prior to 31 December 2008 been granted to an importer by the Competent Authority of a Member State under Article 11(6) of Regulation (EEC) No 2092/91 shall expire on 31 December 2009 at the latest. Regulations (EC) No 345/2008 and (EC) No 605/2008 are repealed. References to the repealed Regulations shall be construed as references to this Regulation and shall be read in accordance with the correlation table in Annex VII. (2) OJ L 108, 18.4.2008, p. 8. (3) OJ L 114, 30.4.2002, p. 132. (4) OJ L 114, 30.4.2002, p. 1. (5) OJ L 166, 27.6.2008, p. 3. (6) OJ L 250, 18.9.2008, p. 1. (7) OJ L 13, 19.1.2000, p. 12. (8) OJ L 251, 27.7.2004, p. 9. (9) OJ L 302, 19.10.1992, p. 1.
livestock products bearing or intended to bear indications referring to conversion. 2. Origin: products of category 1(a) and organically produced ingredients in products of category 1(b) that have been produced in Argentina. 3. Production standards: Ley 25 127 sobre ‘Producción ecológica, biológica y orgánica’. 6. Certificate issuing bodies: as at point 5. 7. Duration of the inclusion: 30 June 2013.
processed agricultural products for use as food composed essentially of one or more ingredients of plant origin. 2. Origin: products of category 1(a) and organically grown ingredients in products of category 1(b) that have been grown in Australia. 3. Production standards: National standard for organic and bio-dynamic produce. 6. 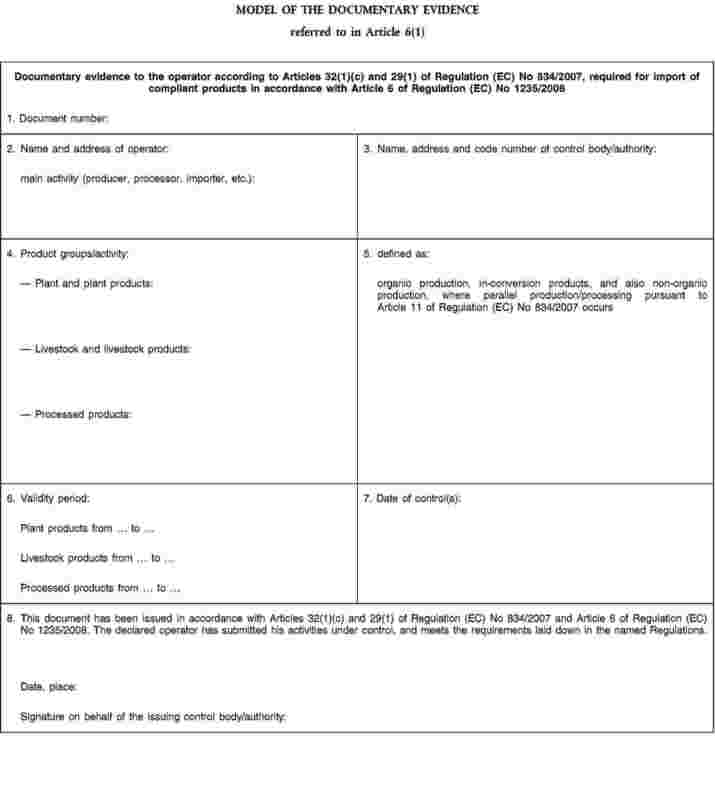 Certificate issuing bodies and authorities: as at point 5.
processed crop products for use as food. 2. Origin: products of category 1(a) and organically produced ingredients in products of category 1(b) that have been produced in Costa Rica. 3. Production standards: Reglamento sobre la agricultura orgánica. 6. Certificate issuing authority: Ministerio de Agricultura y Ganadería. 7. Duration of the inclusion: 30 June 2011. 2. Origin: products of category 1(a) and organically grown ingredients in products of category 1(b) that have been grown in India. 3. Production standards: National Programme for Organic Production. 7. Duration of the inclusion: 30 June 2009.
or from a third country in the framework of a regime which is recognised as equivalent in accordance with the provisions of Article 33(2) of Regulation (EC) No 834/2007. 3. Production standards: National Standard for organically grown plants and their products. products produced during the conversion period and products containing an ingredient of agricultural origin produced during the conversion period. or from a third country for which Switzerland has recognised that the products have been produced and controlled in that third country to rules equivalent to those laid down in the Swiss legislation. products containing products from aquaculture. or from a third country whose rules of production and inspection system have been recognised as equivalent to the MAF Food Official Organic Assurance Programme on the basis of assurances and information provided by this country’s competent authority in accordance with the provisions established by MAF and provided that only organically produced ingredients intended to be incorporated, up to a maximum of 5 % of products of agricultural origin, in products of category 1(b) prepared in New Zealand are imported. 3. Production standards: NZFSA Technical Rules for Organic Production. 6. Certificate issuing authority: Ministry of Agriculture and Forestry (MAF) — New Zealand Food Safety Authority (NZFSA). the layout and the dimensions of the boxes.